The holiday season is a magical time in the Portland region – winter fills the air, festive lights twinkle and shopping centers bustle with those in search of the perfect gift. A busy mall brings with it busy parking areas, which is why we’re adjusting bus service near Clackamas Town Center for the fifth straight year. We’ve designed these service changes to keep everyone moving – whether you’re doing a little shopping or heading to work, school or other important destinations. During this time, the eastbound Clackamas Town Center Mall stop (ID 12921) and the Clackamas Town Center Transit Center stops will be closed. Buses will continue to serve the westbound mall stop (ID 12922) across from the movie theater. The Clackamas Town Center MAX Station will also remain open. All buses that normally end their trips at the Transit Center will serve a temporary stop located along Driveway #3, between the movie theater and Monterey Avenue, before traveling to the SE Fuller Road MAX Station. 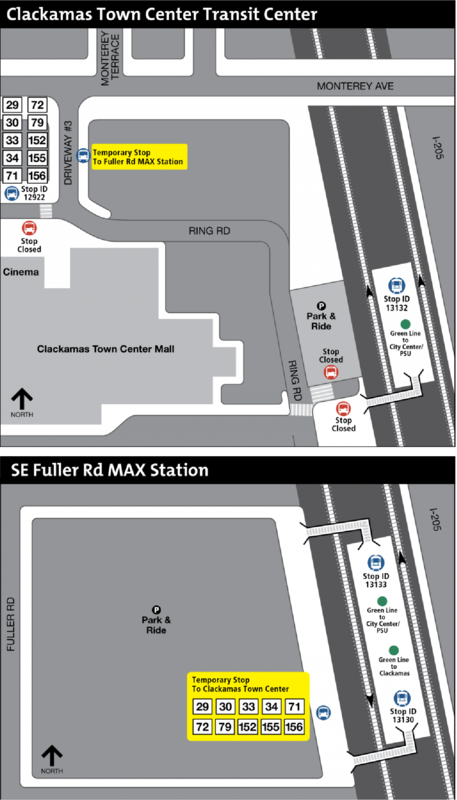 Get off at the Clackamas Town Center Mall stop and proceed about a ½ mile to Clackamas Town Center TC MAX Station. During service adjustment periods, we ask riders to make a plan for their trip. Check the weather forecast and give yourself at least 15 extra minutes to make connections and transfers. Since temporary stops do not have shelters, carry or wear appropriate rain or winter weather gear. To ensure the safety and comfort of all passengers, we ask riders to avoid bringing large strollers on board TriMet buses. On buses, all strollers must be folded for safety. Holiday shoppers are welcome to bring bags and packages with them but should ensure they don’t bock the aisle, stairs or doorways.